What do you get when you mix some of the best motorcycle helmets in the country with the godfather of tattoo design and a noteworthy French designer? An amazing line-up of helmets that are creating a real buzz in the motorcycle industry! 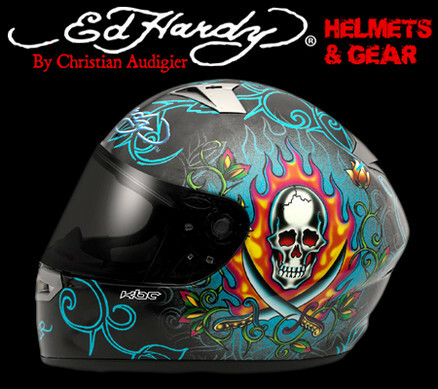 Ed Hardy signature custom motorcycles helmets have found a way to bring James Dean back to life by melding old school tattoo designs with modern day technology. The Ed Hardy helmets appeal to everybody from the surfer in a panel truck looking for a custom beach cruiser or the computer executive itching to bring excitement back into his life. Our customers include notable actors and athletes; such as bad boy Mickey Rourke and award winning Oscar actor Adrien Brody not to mention a growing Ed Hardy presence in over 52 countries.